Donnie, aka RP Donald Trump, is an almost 3 year old black male born October 10, 2014. His sire is Reward Trent and his dam is Kelsos Babycham. Donnie has a total of 44 races on greyhound-data.com starting at Ebro Greyhound Park in Ebro, FL on June 23, 2016 and ending at Sarasota Kennel Club in Sarasota, FL on April 19, 2017. Donnie is now ready to take it easy at home. Donnie is not considerd to be cat or small dog tolerant. 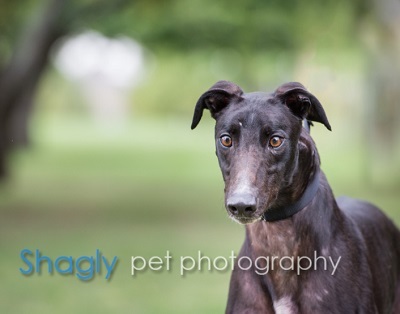 Donnie is a handsome young black greyhound who has transitioned beautifully from retired racer to house pet. It took him no time at all to figure out the dog door and has had no accidents in the house. Noises don't frighten him at all, he's very easy going and is a champion roacher. Donnie is so affectionate, he will do a little dance for you when he thinks you're about to feed him, treat him, or take him for a ride - he loves the car! Donnie wants to play with the other dogs in the house, though he is gentle and understanding when it’s time to stop When I come home from work he gets so excited that he bounces all around me like a bunny! He is a stuffie addict - I have learned to never turn my back for even a split second at a Meet and Greets- he will steal any stuffie that squeaks. At home he will collect small electronics and shoes so will need to be muzzled when alone. Donnie loves all people, young and old, is respectful with the small dogs he has met though he is not too happy with cats. If a squirrel dares enter his territory, he is suddenly wide awake and barking. Apartment life may not be the best fit for him due to his vocalizations! Because he is so people-oriented he could perhaps be an only dog if his people are around as much as possible. 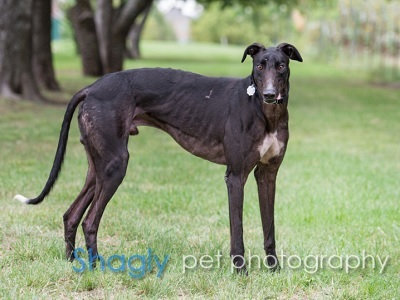 Donnie is always a hit in public and a pleasure at home- come met him and see for yourself!